The fierce social media ding-dong over Brexit did have one entirely unexpected result for me – I gained a new insight into the perennial debate about Marxism versus Capitalism. At one point – pre-referendum – I was challenged to name a single definitely predictable benefit of leaving the EU. I replied that food and some other goods would be cheaper if bought on world markets rather than at the artificially high price levels maintained by the single market. I freely admit that for a few moments I was rather taken aback by this response. Was I really advocating the kind of right wing economics that cares nothing for the wellbeing of others as long as costs were kept down – like some Victorian mill owner? It was, of course, these kind of working conditions and this kind of exploitation in early industrial Britain that led Karl Marx to write “Das Kapital” and launch what became a worldwide socialist movement. Marx had befriended Frederick Engels, the son of a highly successful German industrialist who ran factories in Manchester. In the slums of Manchester the young Engels found the first hand evidence that fueled Marx’s developing theories – evidence of child labour, overworked and improverished workers and the despoiled environment. This abuse of labour by capital persisted in one form or another for another century. Traces of it were still around when I started working in a factory in the 1960s. It can still be found today in some parts of the world and it has come to form a kind of powerful collective memory of what can happen when some men exploit their fellow men for profit. It was this kind of exploitation that my opponent had in mind when he asserted that low prices can only come about through exploitation. But in thinking this way, he – and many others – have fallen victim to a view of a history that has long been superseded by a quite different approach to manufacturing. As a reporter on business and industry, I’ve visited scores of modern factories. I know from first hand experience that the reason these factories are clean, well-lit and well-run is not because of employment legislation (although that has played a part) and not because factory owners have experienced a religious conversion or developed a social conscience – on the contrary they are hungrier than ever for profits. The reason why working conditions have changed dramatically is mainly because there are specific working practices that are far more effective in increasing production and raising profits. Today, an intelligent manufacturer divides up his production processes in terms of how easy or difficult they are. New workers are put onto the easiest tasks, which are also the lowest paid. Workers are continually assessed and those workers who can produce the highest number of finished work pieces in a given time, with the lowest number of pieces rejected by inspectors, are given more complex tasks, and paid more highly. If they perform well on the new tasks, they are given still more complex and more highly paid roles. This ladder of higher rewards for higher accomplishments often has no ceiling. I have visited some factories where it is possible for someone working on the factory floor to earn as much as a board director – in some cases even more. In a country like South Korea, where these practices are normal, there is hardly any longer a discernible “working class” in any sense that Marx or Engels would recognise, as the standard of living and working conditions are so high. In Marx’s day, workers were exploited – as he pointed out is Das Kapital – in that the possession of capital, and ownership of the means of production, meant that the owner could cash in on the surplus value created by his workers, while the workers who produced that added value had to be content with the meagre wages given to them. This aspect of his analysis remains true today – ownership of the means of production gives the owner the ability to profit from the value created by his employees. But there were also a number of other factors present in Marx’s day that are no longer with us. First was a strong sense of social class that “put people in their place” – and kept them there. Owners considered themselves socially superior in every way to their workers and most took steps to maintain this imagined superiority. It would have been unthinkable that a man on the factory floor could earn as much as a company director, for reasons that had nothing to do with manufacturing efficiency. The fact that working conditions were filthy and dangerous also reinforced the inferior status of workers. A precarious employment system where people could be hired and fired on a whim also helped keep people in their place. Today, any intelligent employer knows that imposing any such conditions on his staff would be grossly counter-productive and that the biggest impact of such conditions would be felt in reducing his profits and the market value of his shares. Importantly, this applies not only to factory owners in Britain and other developed nations; it applies equally to factories in Pakistan, Thailand, Indonesia or China or anywhere else that there is plentiful labour. Of course there are still abuses – Marks & Spencer uncovered one recently where kids of 12 were employed making clothes when they should have been studying at school. But in the overwhelming majority of cases, parents of even the poorest families know full well that their best chance of improving their lot is through making sure their children get an education and a well-paid job. And even the dimmest factory owner knows that his profits crucially depend on paying enough to come up to western acceptance standards. The day of the sweatshop is over, not because capitalists have seen the light ethically, but because they have seen the bottom line of their spreadsheets swell as a result of thinking about workers as a useful element of their operations, rather than as an easily replaced cheap commodity. 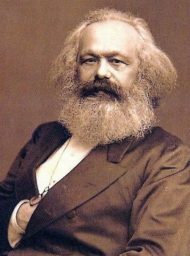 If Marx were alive today, he would find plenty of social injustice in the world to write about, but he would find that his trainers, his jeans and his lamb chops were cheap, not because of exploitation of labour, but because the economics of manufacturing are significantly different from his day. Next Next post: Is the Media corrupt?